Have a leisurely swim, picnic or take a walk around the historic gold mill ruins at Adelong Falls. The remarkable stone ruins give a glimpse of how reef ore was processed, and there is no better place to sit on a hot summer day than on a rock in the babbling water of Adelong Creek. Blowering Dam is a great spot to camp, fish or, for the more adventurous, waterski. The drive alongside the dam on the Snowy Mountains Highway offers beautiful views and spectacular photo opportunities. 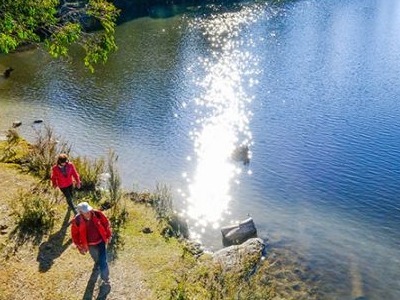 Grab lunch in Tumut and walk it off with a wander along the Tumut River. The Sugar Pine Walk near Laurel Hill is a magical, mystical place any time of year. The remnants of a pine plantation planted in 1928, the trees are now giants, quietly keeping watch over the hills. In summer the forest is cool and quiet, in winter the icicles and mist turn it into a place fit for fairies. Paddys River Falls is a hidden waterhole, perfect for summer swimming. An easy walk from the lookout will lead you directly under the falls. Scamper the rocks to reach the water or get a better shot of the 18-metre high waterfall. Tumbarumba is making a name for itself as a developing cool climate wine-growing region. Several local wineries have cellar doors for you to sample. Wander through the historic township and along the creek and parklands before getting back on the road to Wagga. The Hume and Hovell Track passes right through the Tumut and Tumbarumba region and can be reached via several access points. Whether tackling longer sections or just short walks the track passes through a variety of terrain. An hour past Tumut, Yarrangobilly Caves are some of the most beautiful in Australia. Guided tours of the caves operate daily. Head to Selwyn Snowfields for family friendly skiing, snowboarding and tobogganing in winter. First published: 12 Jan 2018.